Two large (5.5 inches tall) sponge rabbits are shown to the audience. A volunteer selects one of the rabbits, which is placed into the volunteer's hand. The other rabbit is placed in the magician's pocket. After a pause and some funny business, the volunteer is asked to open her hand. Out pops two rabbits-the magician's rabbit jumped from his pocket to the volunteer's hand! Both of the large rabbits are then placed into the volunteer's hand, and after a pause she opens her hand and now the two large rabbits are joined by a bunch of baby bunnies! 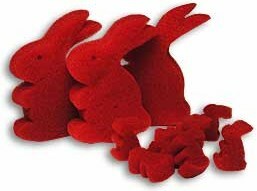 Brian asks: How many small bunnies are there and are they the same size and quality of the bunnies from the discontinued Rabbit Explosion? Thanks.